A patio awning not only adds a great look to your home, but it also has many practical benefits as well! Creating an entertainment space outside your house is just as important as creating one inside. Summers are meant for enjoying the fresh breeze, heat on your bones and entertaining your guests through cookouts. To provide a safe, enjoyable space for your family and friends to enjoy, buying a new patio awning for your home will prove to be the winning purchase. Here are just a few reasons why a new patio awning is the perfect summer investment. Any extra entertainment space will add value to your home and your new patio awning will be a future homeowner’s dream. 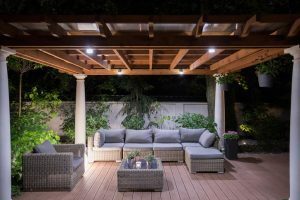 Summers are meant to be spent outside and creating a space for kids and adults to have their fun while staying cool is key to creating an successful entertainment space. Who wants to enjoy the weather from inside their house when they can go outside and enjoy it without the harsh sun rays? If you notice your energy bill going up every season when it gets too cold or gets too hot, adding a new patio awning could reduce the extra unwanted cost. Awnings not only protect you from the sun in the summer, but also the sun heating the inside of your house by shining through the windows. Your house will be nice and cool protecting your kitchen or living room from UV’s. This also proves to be efficient in the winter time as pulling in the awning lets the sun shine through creating a warm atmosphere and lower heat usage. With the unpredictable weather during the Summer, there’s no telling when the weather will be clear and sunny and when the pouring rain will commence. By staying ready for any weather condition with your new patio awning, your guest will not be forced to leave your cookout early just because of inclement weather. Not only will it protect your guest, but also your furniture from such weather conditions that will damage and lead to spending more money every season. There’s no questions the best place to entertain your guest in the Summer is outside on your patio. While the weather is hot, no one wants to be in the house and the grill out becomes a meeting point for all your guest. Everyone will flock outside, so why not create the perfect space for them to have a great time? By purchasing a new patio awning, your guest will enjoy your company even more while staying cool and shaded from the bright sun. Tan lines and dehydration won’t even be a thought with your new awning creating a safe, enjoyable space.